Love can be Messy – Emily L. Pittsford….Author of "A Most Incredible Witness"
Love. We all want it. We all need it. And we all think we do it really well…but what does it look like? When our son Tim was in Jr High he had the aspiration to go to the Air Force academy. Well, how exciting. We even got a call from the secretary to our local congressman to set up an appointment for review. During this time my husbands sister won tickets to go to all the festivities to a bowl game here in San Diego, the Holiday Bowl. Well, they had an event on the navy ship the midway. And of course they had navy recruiters set up. So, my husband Bill went to talk to them. He called me with information about the navy academy. That they actually had more jets to fly than the Air Force. After I got off the phone with Bill I yelled these pearls of wisdom downstairs down to Tim so he would hear me. I expected him to jump on it. Instead he gave me a pearl that I still rely on. He shouted back to me “consider…the…source“. I laughed as he again, with a few words gave wisdom to a situation. (Though this may be true…but still). So…back to love. Let’s consider the source. In that we are created by a creator, I can’t think of a better source of love than Him…God. Now…yes…there’s more scripture on love than most likely anything. But what does God’s love look like. Ha…to describe this in a blog…you and I don’t have enough time. So from my viewpoint, love can be messy. What? No…it’s long walks on the beach, against a sunset while waves crash at the lovers feet with rolled up pant legs holding their shoes as they fade off screen. Yah right! I can hear the sound of car brakes now. No…it’s messy. It’s doing things we don’t want to do for someone else. It’s putting our “rights” aside for the betterment of another person. It’s doing yard work without gloves (I just cringed). It’s feeding those that you disagree with. And all with the hope that somehow they will see Jesus in you. Because at the end of the day true, Godly love is about the other person. And even more important true love provides a way to know God. Otherwise it is a selfish love. (And that’s a whole other blog post). Because that’s what God does for us. He sets up our whole lives giving us every chance to know Him. He digs in the dirt for us, as He knows how to cultivate us so that we will produce the best fruit possible. He holds our hands when we are hurting. And cries with us when others hurt us, sometimes even standing in to take the pain. And that’s messy. And that should be our model. Because loving a person from afar…well, that’s not bad. But telling them how they should live their life…pointing our finger at them is never going to win anyone’s heart to Jesus. So if your child is lost there is nothing wrong with going to find them…showing them the way back, or to God. By you yourself modeling who He is. And this may take work and sacrifice. To figure out what inside of you needs fixing. By asking for the mind and heart of Christ. So maybe, just maybe they will see Jesus in you and He will look good enough to follow. I don’t know how I landed in the Castro’s theater in the Mission District in San Francisco, this little Christian girl from So Cal. 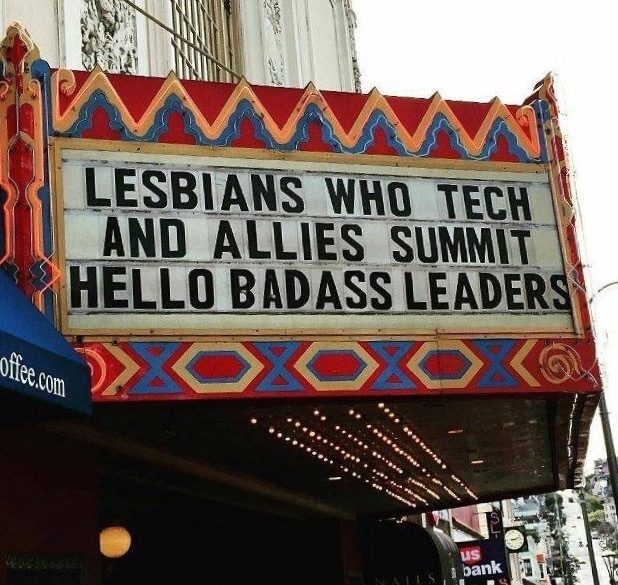 To sit with 1500 lesbians at our daughter’s conference on technology for lesbians this weekend. It will take a book or two to explain. But here I am. And as I told a new friend of mine…I am just honored that they have welcomed me with open arms as I know there are those Christians that would rather hate them. And they know it. I trust that all of this will matter. That Bill and I can make a difference by introducing them to Jesus. With simple service and showing up. And if…by chance…out of the millions if not billions of items on the internet any of you “just happen” to read this. Know that I love you. That we are all broken and in this together. But let me introduce Jesus to you…He can help. It might seem messy, but He will love you through every step to heal those broken places. And ultimately make you whole, with streams of living wate, that can wash you white as snow. And then you can get your hands dirty, and help someone else learn that love can be messy., but oh so worth it. What was the hardest thing you’ve done for someone, in order to show the, the love of God? I like that! Definitely challenges me in my relationships with family. I want to be the one that bridges the gap, so that they can see that God loves them no matter what. It’s easy to disagree and then distance oneself but if we don’t show them God’s love, who will? Thank you. I love these woman and men…to the moon and back! I would go to the ends of the earth for them. And family is always the most difficult, but God can mend anything when we allow Him to lead. Pingback: Should We Go After The Homosexual – Emily L. Pittsford….Author of "A Most Incredible Witness"
Pingback: Should we go to our Gay Child’s Wedding? – Emily L. Pittsford….Author of "A Most Incredible Witness"